A common problem in risk analysis is to elicit reliable, realistic estimates of uncertain quantities in your model. 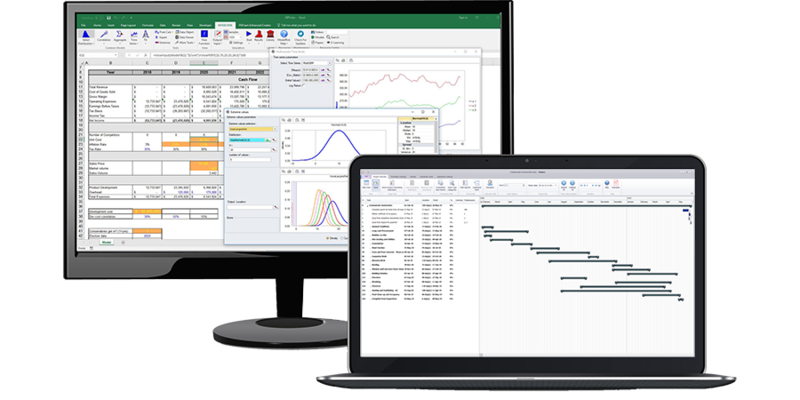 ModelRisk offers two interfaces to help achieve this: the Expert window described here for single uncertain variables; and the SME Time Series window for uncertain time series forecasts. 3. Click the ‘Calculate list’ button to see the options that are available. In the following image, the minimum, mode and maximum have been used, and ModelRisk has provided a list of potential candidates. On the left a ‘Distribution list’ provides all available options. Un-ticking any distribution will remove it from the graphs and statistics tables.. In the middle are relative and cumulative plots of each distribution within the list. Clicking on any item in the ‘Distribution list’ will bring that distribution to the front of the chart. On the right is a table of statistics to allow you to compare, for example, the means or percentiles of the available options. Once an appropriate distribution has been selected, the user can click the ‘Insert in Worksheet’ button and select to enter a distribution random sample or object function for the selected distribution. ModelRisk will then enter the function into Excel, and add an Excel Comment to display just how this distribution has been defined. This is useful in situations where, for example, one has defined a mean, standard deviation and skewness and found the most appealing option to be an unusual distribution like a Bradford or Fatigue. 2. Choose whether to edit the relative or cumulative plots. In general, it is more intuitive to edit the relative plot. 3. Double-click within the selected graph to create some extra points, and then use the mouse to move them around and create the shape you are looking for. 4. Take note of the statistics in the right pane and the graph you are not editing to make sure that they continue to make sense. Once you are satisfied with the distribution, select the ‘Insert in Worksheet’ button and select to enter a distribution random sample or object function. ModelRisk will then enter the distribution you drew as a Relative distribution if you used the relative plot, or a CumulA distribution if you edited the cumulative plot.